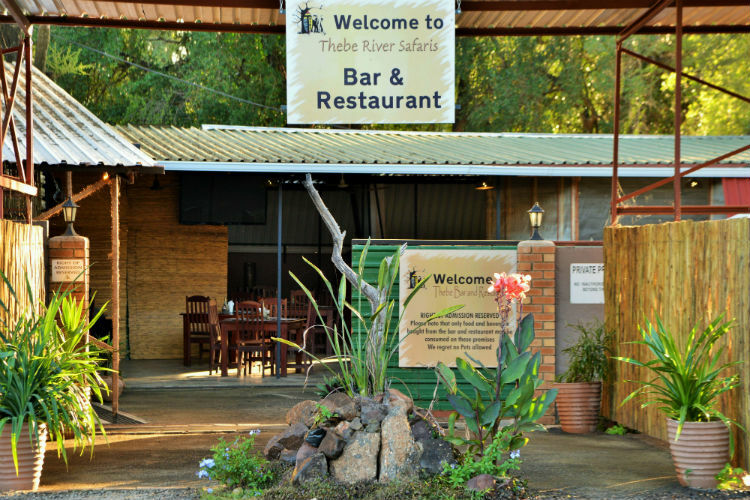 Whether you have been out on a long adventurous day in Chobe National Park or have just arrived from a far off destination, Thebe River Safaris offers the perfect setting to relax and enjoy great food, ice cold drinks and cosmopolitan company within the surroundings of its rustic restaurant and bar area. 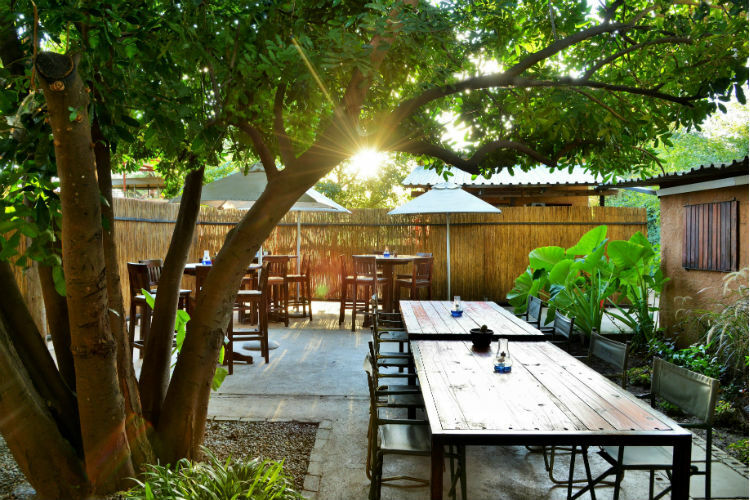 With both covered and al fresco dining areas, a wood-fire pizza oven and a bustling kitchen, Thebe Restaurant offers hearty and delicious meals to suit all taste buds and appetites. 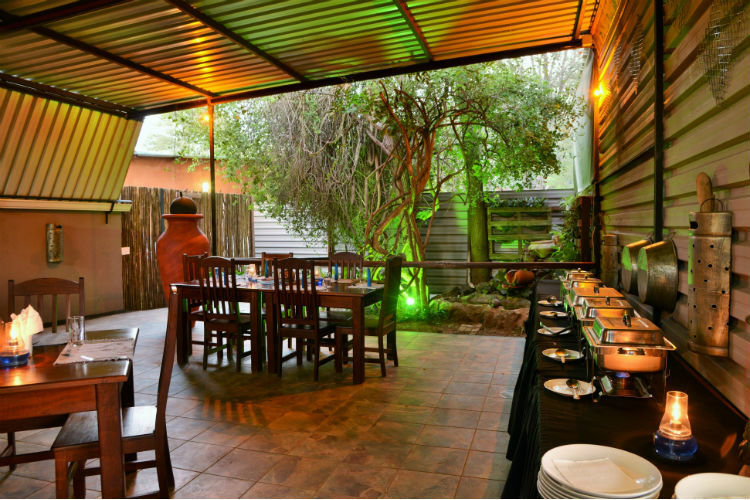 Thebe Restaurant is also perfectly equipped to cater for larger groups, and offers one of the best breakfasts in town whether you're an overnight guest or just dropping in. 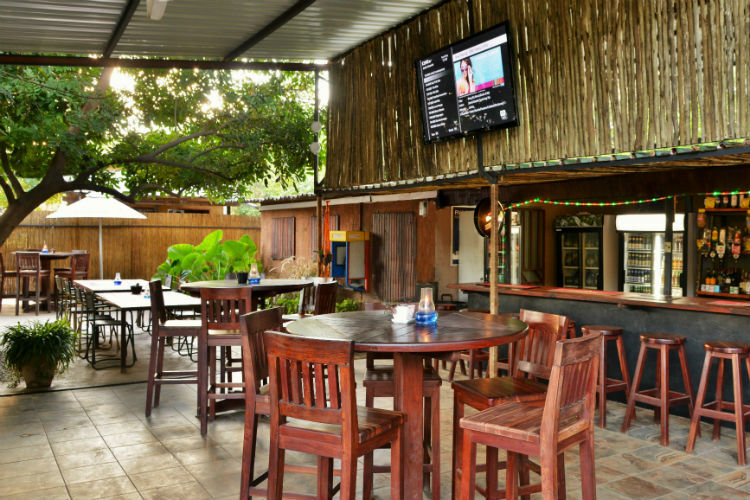 Thebe Bar’s buzzy atmosphere makes it a popular hangout for visitors and locals alike, serving local and international drinks and cocktails, and with the added convenience of complimentary WiFi and a satellite television to catch up on all the latest international news and sports. 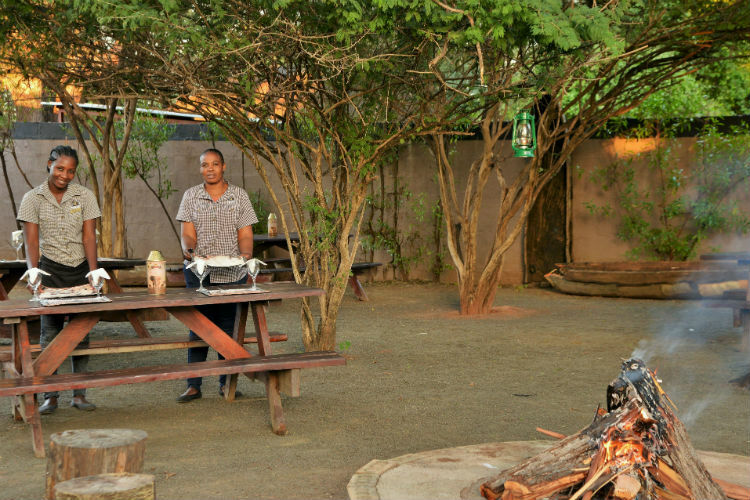 Offering the only wood-fire pizzas in town and a wide variety of hearty meals. 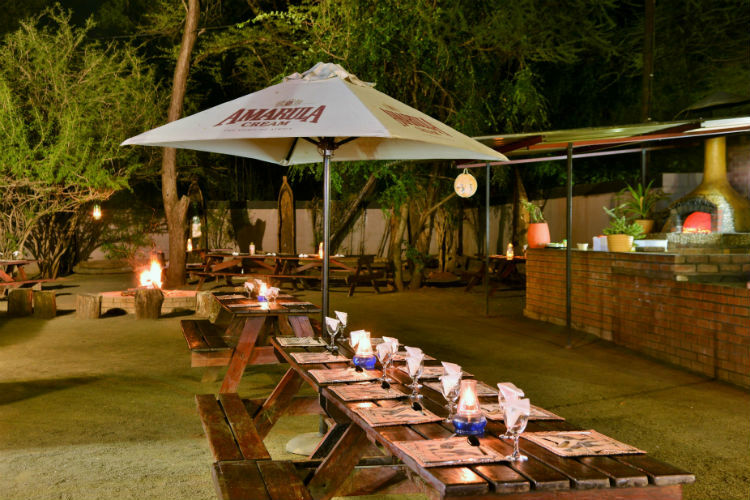 Thebe Restaurant & Bar is the perfect place to chill after enjoying a long, adventurous day. Lightly seasoned chicken strips tossed in a mixed green salad bedding. Olives, feta cheese and chick peas rested on a bed of fancy lettuce. A wholesome garden salad with tomatoes, cucumber, onion and capsicums. Gently marinated beef strips and a boiled egg nestled on a bed of summer greens. A ready dressed salad with smoked salmon slices, cream cheese and nuts to finish. Creamy blue cheese laid on a bed of greens drizzled with blue cheese sauce. A choice of beef, chicken or vegetable complemented with a sweet and sour sauce. Deep fried chicken wings prepared with our very own secret recipe with a durky and blue cheese sauce. Roll garnished with a salad and served with chips. A choice of two fillings (ham/ bacon/cheese/tomato/egg/chicken mayo). Cheese sausage grilled to perfection and served with chips. Coated chicken or beef fillet fried to perfection with our very own home made family secret recipe and complemented with a red wine sauce (optional). Fillet steak grilled to perfection topped with cheddar cheese and vegetables. A 150g fillet steak served with a starch of your choice. Deep fried wings prepared in our very special way and complemented with our famous chilli sauce. All time favourite slow roasted BBQ spare ribs and chips. Fresh fish fillet straight from the Chobe River. Half chicken and chips grilled to perfection and drizzled in a well-known marinade. Spicy meatballs prepared the Thebe way, complemented with a tomato and onion sauce and parmesan garnish. A bacon, mushrooms, herb and egg yolk sauce with parmesan finish. A salmon, mushrooms, herb and egg yolk sauce with a parmesan finish. The all-time favourite, with olives, bacon and red pepper sauce. The all-time favourite, with olives, chicken strips and red pepper sauce. Onion, carrots, celery, beef mince, tomato sauce, parsley, red wine and parmesan cheese. Feel fresh with our classic ham and pineapple flavoured pizza. 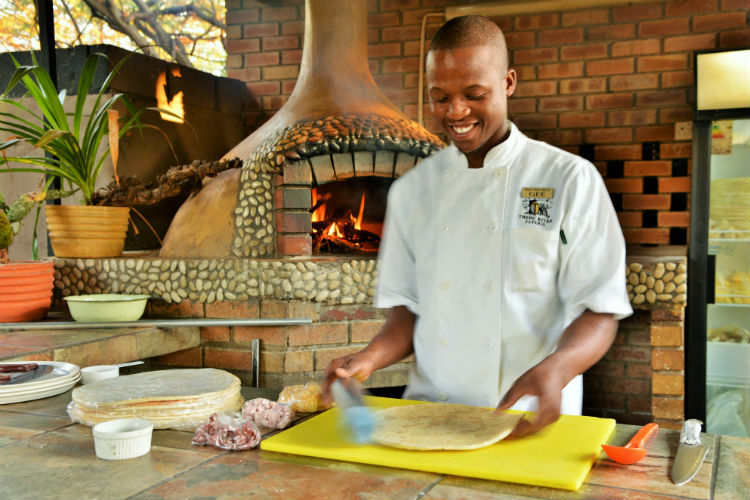 A little touch of Italy in the Chobe with toppings such as ham, salami, olives and mushrooms. Our all-time favourite meat pizza prepared the Thebe way, with toppings incuding chicken strips, ground beef, bacon, salami, olives, onions and mushrooms. Indulge in our home-made margarita pizza with fresh tomato, olive oil and cheese toppings. Spinach, feta cheese, olives and bacon. A fully prepared English breakfast with toast, cold meats, cheese, cereals, fruits, juice/coffee/tea. Cereals, yoghurts, juice/tea/coffee together with fruits, cheese slices and cold meats. With a choice of two fillings (ham, tomato, onion, cheese, mushroom).